Situated in the centre of the beautiful town of Lewes, with easy access to and from the City of Brighton and Hove. The house is in a very quiet, tree-lined lane overlooking The Paddock. 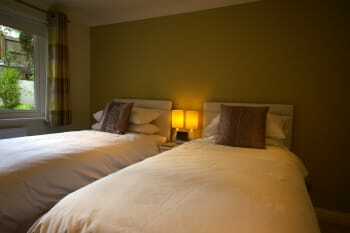 We offer one double room with a king sized bed, and a twin/double room with 2 singles that convert to a super king bed. 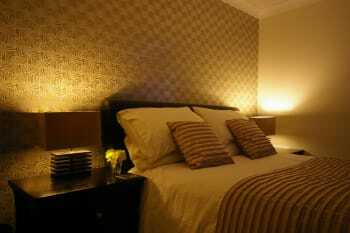 Bedrooms are beautifully furnished with Egyptian cotton, TV, free wifi and tea making facilities. At point of booking please confirm which room(s) you would like and whether a cot is required. We welcome single occupancy, but this can only be booked within four weeks of your arrival date. 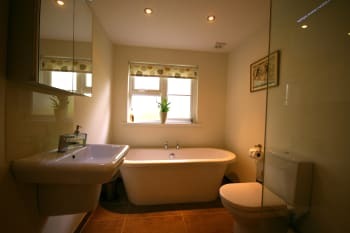 A clean and modern bathroom/wet room with free standing bath and walk-in shower. As we only have one bathroom for our clients, once a room is reserved we then don't let out the second room, unless it is friends sharing or a family. Please note that the bedrooms are on the second floor up 2 flights of steps. 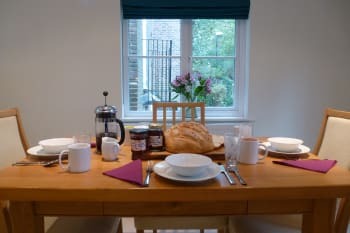 In the morning we offer a full breakfast with homemade bread and preserves too. There are no rooms available at Murrells for these dates. We couldn’t have been made more welcome by Tony and Nicky. They did everything to make us feel at home. Tony’s breakfasts were brilliant with everything locally sourced and beautifully cooked and presented. Nicky’s home made jams and marmalade were lovely too. You’ll need Tony’s directions, or sat nav to find their little street - but once you are in and parked everything in Lewes is so close. We loved the town and all its independent shops. Don’t miss the superb new arts and cinema complex down by the station - The Depot. 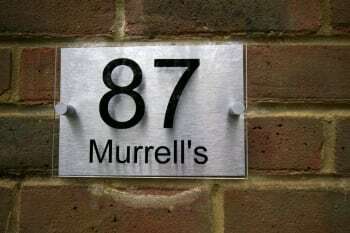 We stayed at Murrell's for two nights and really enjoyed the stay , the rooms/bathroom are extremely comfortable and clean and not too mention a great choice of breakfast , Tony and Nicky were super hosts , very kind and nothing was a problem , overall made it a great stay indeed. Superb experience. Lovely hosts and an absolute gem of a find for us. Especially enjoyed the homemade jams and the lovely aspect out the back of the house. Right of man pub for food and ambiance. Lewes Castle well worth a visit and the twittens! Wonderful location in the centre of Lewes. Beautiful room with a lovely view of trees and a great bathroom with a powerful shower. Tony and Nicky are very considerate hosts providing lots of information and a delicious breakfast. We hope to return in the future. Lewes is a lovely town to wander around. Tony and Nicky are well-travelled and it shows. The B&B is thoughtfully designed, equipped, and managed. Breakfast is delicious with many choices. The hosts are friendly and helpful but never intrusive. An excellent example of what a B&B should be. The Depot is a great place for independent cinema and good food. thanks for the stay; my only comment would be the addition of a small table/desk; as a professional traveller, it is useful to be able to work from a desk in my room. Lovely hosts, who were very helpful and welcoming. Best breakfasts I have ever had - homemade or locally sourced produce. Beautiful room, quiet location but close to High St.
We ate at Right to Arms pub and hioghly recommend the food! It felt odd not to have a lock on bedroom or bathroom door. Probably more of a comment about me than my hosts, who were delightful. NB Paddock Lane is one way and has to be approached from the Paddock Rd end. Walking to/from the town centre: A charming, slightly shorter alternative to walking up Irelands lane to High Street is to go down Paddock Lane, up the path to the right, up the stairs, behind the castle, and down the narrow The Passage. Exit on High Street underneath the clock on St Michael in Lewes Church. And for some entertainment and atmosphere on Saturdays, try http://lewessaturdayfolkclub.org/ at the Elephant & Castle. Tony and his wife are what make Murrells from Tony's initial welcome through to his homemade bread (accompanied by his wife's homemade preserves), excellent breakfast (cooked to order), attention to detail in our double bedroom and bathroom, Tony's presence (should you need anything) and finally his warm goodbye as you leave. 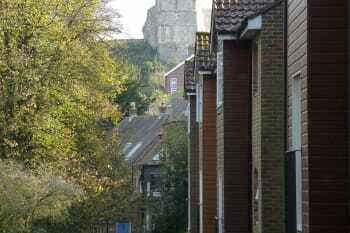 We choose Lewes because of the ease of access onto the South Downs. 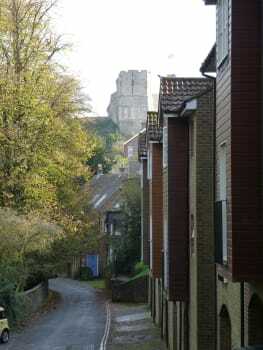 Tony is very knowledgeable of where to walk both in and around Lewes and beyond. Sadly, we did not have the time to explore all his good advice. From Lewes rail station it is very easy to get to Eastbourne and all its attractions. Having a Network Rail card meant a return was only £5.30 (on a Saturday) so cheaper than petrol and parking - a real bonus. Charming, welcoming hosts. Delicious, freshly cooked breakfasts. 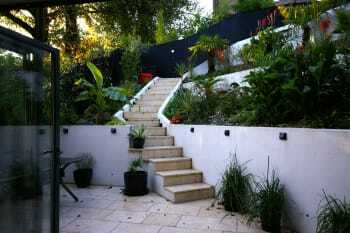 Beautiful, well-equipped accommodation in a quiet location. 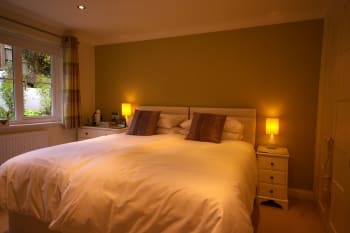 Lovely B&B,great comfort,clean and tidy. Tony was extremely kind with us, always ready to help us, to recommend places to visit and things to do. Delicious breakfast with homely made bread and jams. I can't way to my next visit. Very nice place to stay in, town and station is close by. Everything is good standard, breakfast fantastic! Lewes has it all - lots of pubs (we likes Rights of man and Brewers Arms on High St), cafes (we like Flint Owl on High St) and lots of indecent shops. Don't miss the castle, Anne of Cleevs house and the Southover Grange gardens. There a lots of walks from Lewes - for example to Alfiston (3-4 hours) and to Ditchling: nice villages to visit. Welcoming, very accommodating and provided great advice with regard to town/ south Downs Way. Wonderful personal touch provided by the hosts and a place of peace ( being away from the main thoroughfare). Would certainly return.